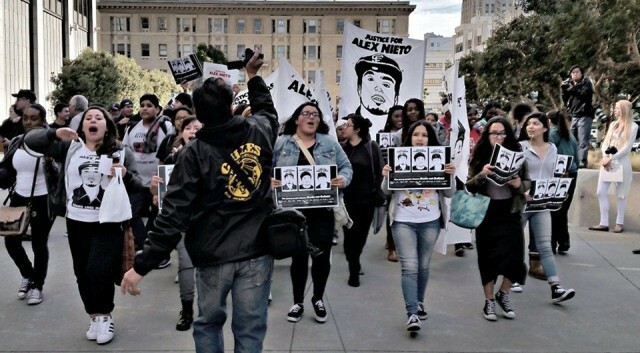 The federal civil trial against the four San Francisco police officers who killed Alex Nieto and the city and county of San Francisco began on March 1, almost two years since Nieto’s killing on March 21, 2014. Alex’s parents, Refugio and Elvira Nieto, had filed the civil suit for the wrongful death and civil rights violations of their son. The trial began a little over a month after the San Francisco Board of Supervisors unanimously voted to call on the U.S. Department of Justice to investigate the shooting deaths of Alex Nieto, Amilcar López Pérez and Mario Woods, all at the hands of the San Francisco Police Department. Nieto, all of 28 years old, was a student at the City College of San Francisco, a community organizer and a part-time security guard. He wore a licensed Taser for the security guard position. Nieto was killed at Bernal Heights Park on Bernal Hill as he was preparing to head for work, after stopping to eat a burrito. A barrage of 59 bullets was fired at Nieto, who cops claim pointed his Taser at them from 100 feet away. A huge rally was held outside the federal courthouse on Golden Gate Avenue on the first day of the trial. Various community members and supporters spoke at the several-hours-long rally. At one point, more than 30 chanting high school students marched into the rally, after having walked out of their classes in solidarity. On day three, a witness named Antonio Theodore, who regularly walks and jogs on Bernal Hill, testified that he saw Alex walking casually down the hill, hands in his pockets. He said officers jumped out of their cars, weapons drawn, yelled “Stop!” and then immediately began firing. The investigative officers said that no officers claimed to have touched the Taser that the cops claimed Nieto was pointing at them. Also, the person who originally called 911, Justin Fritz, apologized to the Nietos for calling the police on him. Fritz claims Alex Nieto had done nothing wrong that day. The fourth day of the trial was completed on March 4, with expectations that it will continue up to March 11. Ex-chief medical examiner, Amy Hart, testified to a wrist bone fragment found in Nieto’s jacket pocket and admitted that this could corroborate witness testimony that Alex’s hands were in his pockets. Officer Roger Morse, who arrived after the shooting began, but also fired shots, testified that he didn’t see a red laser light coming from the Taser. He was the first to approach Alex’s body after the shooting and said there were no Taser wires exposed. Reports from morning of Day Five include the following from observers on Twitter: Brian Childs, Tech Compliance Manager from Taser International, testified that taser was fired at 19:14:16, 19:14:23 and 19:14:32 PST on 3/21/14. He thinks it was actually off by ~4 min, 29 sec. He said that he can’t find data showing that Nieto’s taser was ever time synced since it was purchased, so all the timing data is essentially pure speculation. Additionally he said that the crime scene image of Nieto’s taser shows that it was off, so there is no way the officers could have seen the red light they claim to have seen.